If you’ve never before used trial presentation software in your practice, now is the time to consider it. 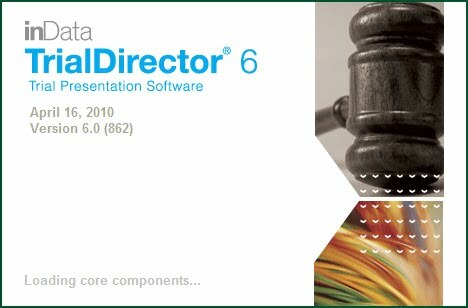 If you’ve used previous versions of TrialDirector or other trial presentation software, now is the time to consider springing for the upgrade. Note: Since this remains a popular article, I will add that TrialDirector 6.2, build 900 is the current version, released 12/16/2010, and that several things have been upgraded and even some great new features have been added. I also anticipate another release within a few days to fix a PDF issue. With such a major overhaul of the program required to work with Windows 7, these past few months have allowed the folks at inData time to get the "real world" feedback necessary to make sure that it continues to maintain its reputation as the "Gold Standard" in trial presentation software. It is comforting to know that they are driven to continue developing and improving the program by listening to those who actually use it daily. Hope you enjoy the review. 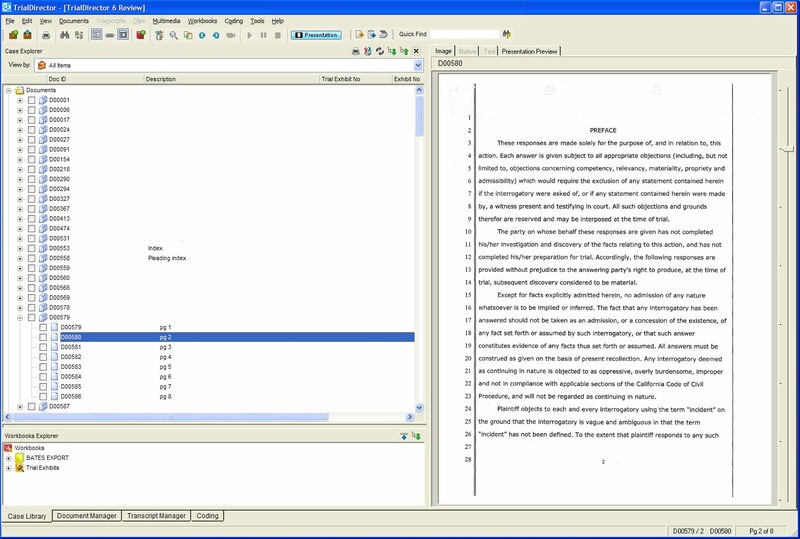 Four years in the making (version 5 was released on 5/1/2006), TrialDirector 6 brings together all of best features from previous versions, and includes many feature requests by current users. This shows they are listening. I have been running version 6 for several months now (going through Alpha and a few Beta versions), and unlike many new software releases I’ve worked with, this one is now stable and ready for prime-time. As a disclaimer, I will say that I have used TrialDirector for many years and have a close working relationship with inData, the makers of TrialDirector. I have not been compensated by inData for this or any other reviews or mention of their products, nor have I submitted this article to them for their review, approval, editing or modification. I have also used other trial presentation software with good results. Competitive products such as Visionary and Sanction are also excellent platforms for trial presentation. That stated, while I may admittedly be a bit partial, I will do my best to offer an objective analysis of TrialDirector 6 in this brief review. For purposes of this review, I will not attempt to cover every feature of the software, nor those features which were already in version 5. 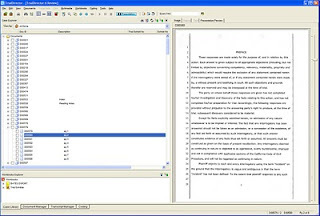 For more info on version 5 (and some features in common with version 6), please refer to my review (http://trial-technology.blogspot.com/2010/04/review-revisited-trialdirector.html), or to the inData website (http://www.indatacorp.com/) for additional product information, including a very helpful new set of online tutorials. Upon launching the program for the first time, everything looks familiar. The Case Library view looks like version 5. From here, we will take a look at a few of the major changes – the first being something I have been asking inData to implement over the past 4 years – the return of the Grid View. The Document Manager tab now brings back the fully functional, editable and sortable database view, reminiscent of version 3 and 4. For the occasional user, this may not be a big deal, but for those who must build and manage large databases, and many of them at one time, this is a critical feature. It simply allows another perspective (albeit somewhat geeky), that enables quick editing of any column. So, instead of having to right-click on a document in the Case Library to display properties, or use the F2 shortcut to get a one-line editable row, you can now see all of them at once. This is not actually a “new” feature, but rather an improved version of something dating back to version 4 that simply makes sense to those who use it. Not everyone will appreciate this feature, but for those who will use it, it’s one of the best parts of version 6. Sometimes, older is better. Also, the Coding tab at the bottom is essentially the same database as in previous versions. There is nothing monumental to report here in the way of updates. It works great, and does everything a basic coding database should do. The Transcript Manager also looks familiar when you click the tab on the bottom – but it has been totally revamped. Being a long-time user of TrialDirector, I had become accustomed to creating clips by selecting the desired text and then listening to “edit,” or trim the beginning and ending of the excerpt. Can you simply input the page:line designation start and end to create a clip? Yes. Can you select the desired text to create a clip? Yes. 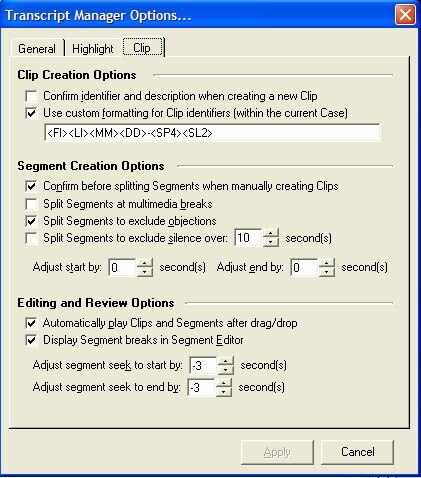 Can you use the clip wizard to assemble clips? Yes. 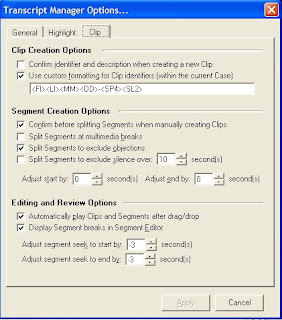 Can you use the segment editor to create and assemble clips? Yes. Can you still edit clips by selecting text and then listening to make your adjustments as in version 3-5? No, not really. So, instead of having to manually name the clip, it is already named and sorted for me. You can also choose something like “Clip 1,” “Clip 2,” etc., but then you don’t bring any descriptive information into the database. This method also enables me to view the text, making sure it makes sense, and isn’t starting or ending in the middle of a question or answer. Frankly, I was amazed at the accuracy of the clips when dealing with the visual display waveform editor. Maybe my sync was dead-on accurate, but the start points were almost always perfect – something that would rarely happen when using only the audio (tape deck or VCR-inspired controls) for editing – regardless of sync accuracy. As a result, clip creation and editing speed are now much faster and more precise. Perhaps the most important thing TrialDirector or any trial presentation software can do is present evidence to a jury and/or judge. Of course, without a proper system and method of data management, it wouldn’t be much better than PowerPoint. That stated, if you’re looking for bells and whistles and/or cool new features, there are plenty to be found in the presentation and what I will refer to as the “pre-presentation” areas. 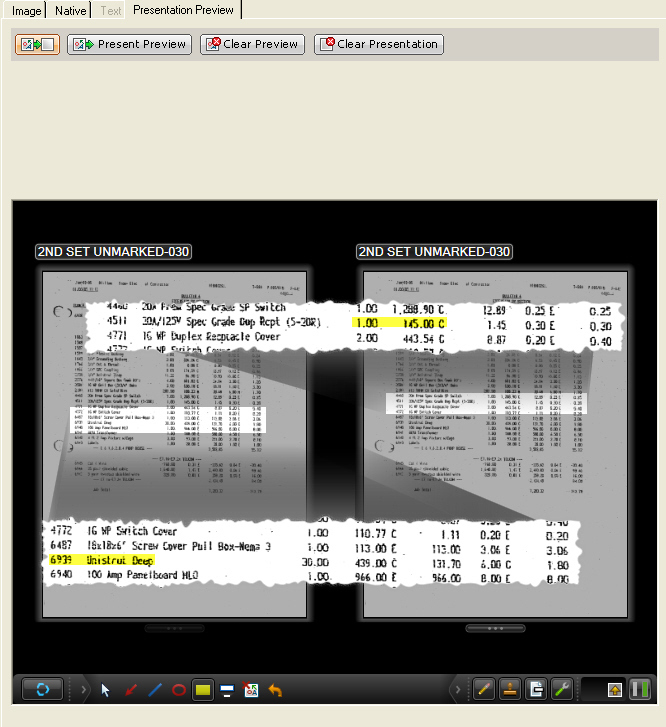 When in dual screen mode (one showing the database, the other the trial presentation), there is a new “Mirror Mode” feature which allows the user to zoom, highlight and/or otherwise work with a document in the “Preview” screen and have the results displayed “live” on the presentation screen. So, rather than display the cursor or other annotation tools in front of the jury, you can simply have your work “appear” on the presentation, while you are working in the preview screen. A real benefit of all of this is that although you are able to display only the results, you are still able to view and work in the database, and if you need to move the cursor over to the presentation to point something out, you still can do that. So, you now have the option of setting something up in Preview and then presenting it, or doing the whole thing “live,” in addition the typing in an exhibit number, using barcodes, or the improved document explorer in the Presentation screen. The toolbar has a nice “auto-hide” option, in addition to improved settings which may be saved. The presentation also offers some very flashy (read: glitzy) display options, such as a mirror and backlight effect, which are probably a bit over the top for actual trial presentation. They can be used for other types of presentations, however, as in a recent matter in which I provided a recap of the trial in a PowerPoint presentation. For that, I was able to take advantage of some of these effects. If you already own TrialDirector, I would say the decision to upgrade is a no-brainer. If you are current with your TrialDirector 5 annual maintenance, the price of the upgrade is offered at a 50% discount. If you are purchasing without a qualified upgrade, the list price is $695 for the software, plus $139 for annual maintenance, keeping it in line with other competitive programs. The upgrade from version 3 to 4 was dramatic, 4 to 5 introduced many new features, and now TrialDirector 6 has really brought it all together. In my opinion, inData’s TrialDirector has once again raised the bar, which will likely help it remain the market leader in trial presentation software. Where do trial technicians get trained? Where are the courses and texts for trial technicians? How do you know if someone has received adequate training of the core competencies? While the original topic of this post seemed to be directed more toward the technical issues of trial presentation, ethics and proper protocols are certainly a key part of this profession. It is not enough to simply know how to put up documents with TrialDirector if one doesn’t know how to effectively communicate with counsel or know the rules of the court. I would also add that there should be a distinction between a trial tech and a trial consultant, the latter having a great deal of actual experience in offering helpful insight regarding the trial itself – not just the technical issues. You won’t get this with a certificate. As a result of having been employed by a major law firm, I learned things like ethical issues, the litigation process and many things that make up the big picture. While I would suggest that this may be one of the best possible routes one might take, it is not always an option. Law firms, like most other companies, aren’t in the business of training people who have no prior experience or qualifications. That stated, I am a strong supporter of the efforts of OLP, NCRA and ALSP in their respective roles of developing course material and examinations for certificates and certification of trial technicians and other litigation support roles, such as electronic discovery. While the NCRA (National Court Reporters Assn) has their roots in other areas, I will say that the people actually involved in the trial presentation section are indeed qualified, and are not court reporters. They can also provide a natural transition path for the many legal videographers they represent. I was very skeptical at first as well, but can say (first-hand, as a guest-instructor) that if they continue in the same direction, they will likely succeed. They do have a wealth of experience in education and certification processes. The OLP (Organization of Legal Professionals; they have a LinkedIn Group) is a relatively new organization, which is focused primarily on education and certification in several areas. Having this single focus will certainly be beneficial, and the Principals and many members have a great deal of experience in education of legal professionals. They are also reaching out to many well-known and established professionals to increase their level of credibility. The ALSP (Association of Litigation Support Professionals; also have a LinkedIn Group) is yet another organization with similar goals, although (at least to my understanding), they are a completely volunteer organization in these efforts, and as a result, have some limitations with respect to the level of time and resources they have available. In my opinion, the ones who will benefit immediately from all of these efforts, regardless of the sponsoring organization are our clients, and ultimately as a result of a higher degree of professionalism, ourselves and our profession. Will one be better than the others? Only time will tell. think it has succeeded in its effort. or save a few bucks. 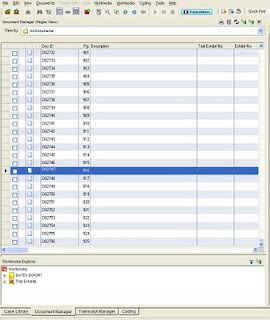 the folder name which contains the actual database. choosing to install in your existing TrialDirector folder may make it difficult to get to your previous version. from two different sources. It may work; it may not – feeling lucky? just been moved around a bit. will likely dive in and feel right at home. similar to selecting the “All” tab in previous versions. It will not affect the Transcript Manager. TrialDirector, that folder with its results is still there. also color-code them for quick visual sorting/organizing. “see” where the speaking begins and ends. and you could not import “standard” coding data. is a very processor-intensive operation. plenty, you might consider getting some training. editing as a result of changes in the interface. and creating a new set of OCR text files. 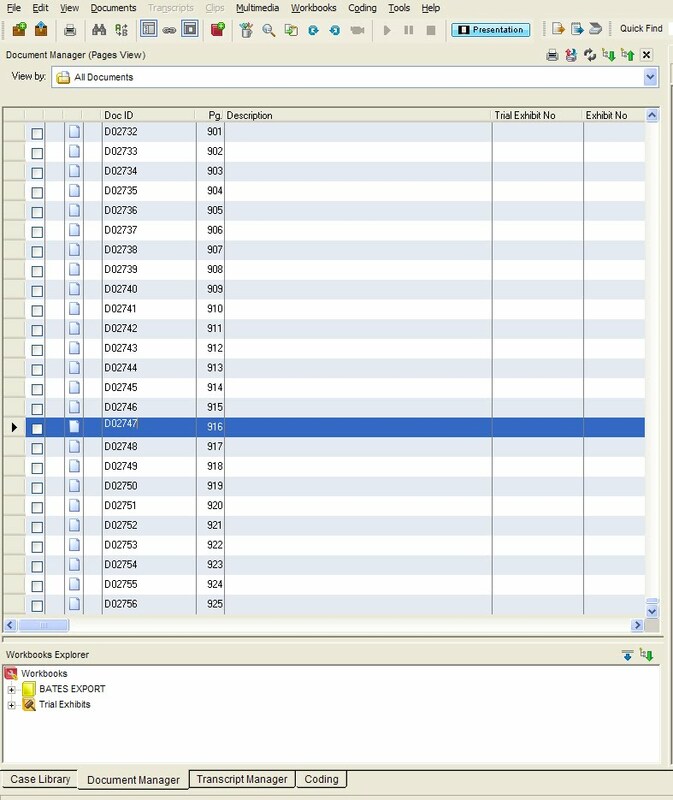 notifying inData of an issue. time learning to use TrialDirector 5 and go to trial? The answer is yes. Would you want to purchase TrialDirector on Friday and then go to trial on Monday? Probably not, but I’ve heard it has been done. likely need to be prepared and loaded first. I’ve been informed we can expect updates soon. “Gold Standard” in Trial Presentation Software. Copyright 2006 Ted Brooks. All rights reserved. civil and criminal cases, on both sides of the table. a frequent speaker and author.